Easymeeting.net reports strong demand across all easymeeting.net services product lines and a great deal of excitement from channel partners for its new product to be launched late in Q3. Easymeeting.net a global video conferencing as a service provider has reported strong demand across all services product lines as well as a great deal of interest in its newest product to be launched in September. Easymeeting.net has also reported that the first results of the new strategic partnership with the ZTE Corporation have exceeded expectations. Easymeeting.net reports strong growth in revenues, new customers and continues to establish itself as an important player in the video meetings market with its easy to use products and focus on user experience. The number of searchable video conferencing rooms in the easymeeting.net catalogue has grown to nearly 10,000. The catalogue provides an easy to locate video conferencing systems directory as well as those that wish to lease their rooms to end users. Easymeeting.net's customer base continues to expand with strong expansion in the Americas and EMEA. EasyConference sales continued to generate the majority of the new business revenue for easymeeting. This supported by a number of channel partners that have dedicated more of their business efforts to the sale of video conferencing services. 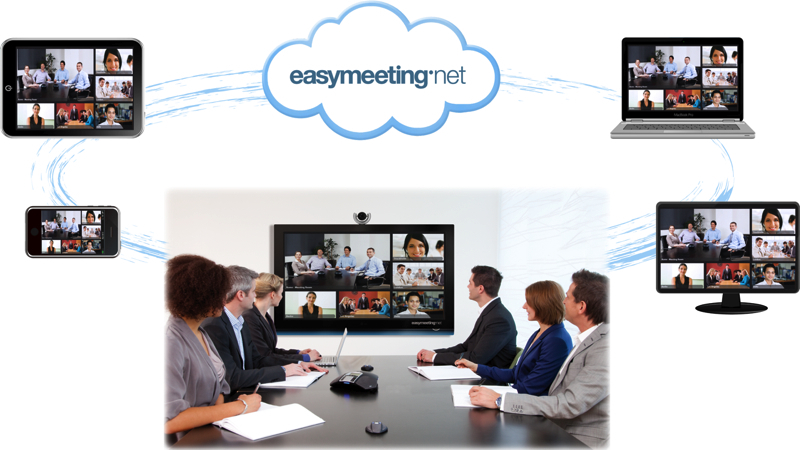 While there has been a continued shift from traditional video conferencing to video conferencing as a service many easymeeting.net channel partners have positioned easymeeting services as the dial-tone in their hardware offerings to their customers to a great deal of success. "I have to be honest it has taken time for many of our channels to adopt their strategy to this model whereas the vendors are often pushing their hardware only based solution to create a cloud, we offer the cloud and our channel partners connect their most cost effective hardware to it to offer the customer a solution with second to none capability at the right price point... Now that is easy," followed Andriopoulos. In spite of a great deal of competition and a continued challenging global economic climate, easymeeting.net has been able to onboard several new major channel partners including a major announcement coming later in Q3 announcing the addition of a major new channel partner that will give easymeeting.net the ability to reach tens of thousands of new customers. "There is a lot of hard work yet to be done, if our competitors have to offer special incentives in order to get a customer demo then the industry has even greater problems that need addressing. We will continue to focus on the benefits and user experience for the groups that would best benefit from using video conferencing and not the tech talk," followed Andriopoulos. Easymeeting as reported earlier signed a Strategic Partnership Agreement with the ZTE Corporation of China earlier this year in order to design and deliver game changing even easier to use services and products. The first results of this relationship will be released shortly. ZTE is one of the largest providers of global telecommunications equipment in the world. ZTE identified easymeeting as a partner that delivers user focused innovative services and one that can make a major impact in not on the video conferencing industry but in the greater market that has yet to adopt video conferencing as a communications tool. More information is available by contacting easymeeting.net.